Data was gathered on 1540 Federal parks and 80,142 campsites from Reserve America (www.reserveamerica.com). 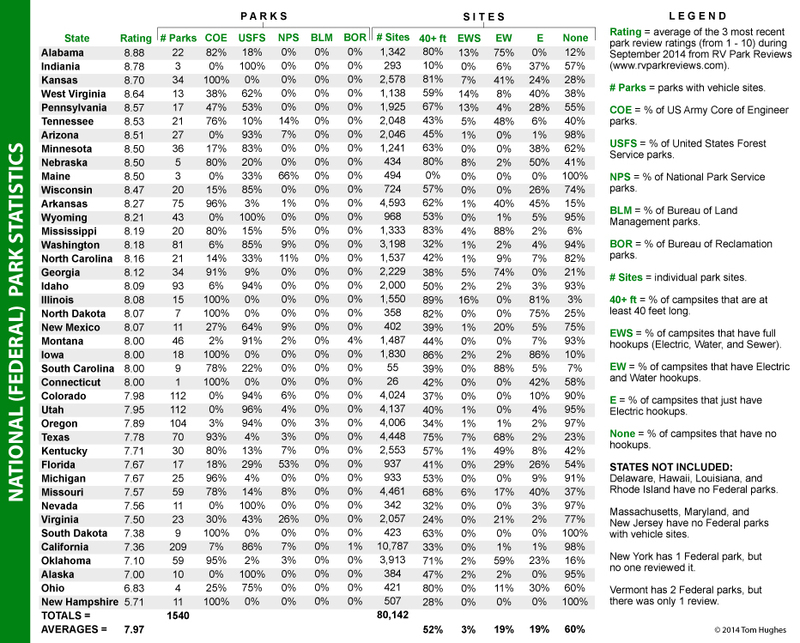 Parks were ranked using the latest (September 2014) reviews from RV Park Reviews (www.rvparkreviews.com). However, on average, 58% of all park reviews were older than 1 year. On average 52% of all Federal campsites were at least 40 feet long, but a number of reviewers mentioned bad or winding park roads in Federal parks. Verizon was the most mentioned successful cell service. AT&T was a distant 2nd place, Sprint a very distant 3rd, and T-Mobile not at all. Wow, you did a lot of work on this! Thanks for posting. I found the l ink to this post on the rv.net campground forum. I stumbled onto the federal park spreadsheet while I was going through your most excellent how-to on setting up a satellite TV for my RV. Great job!!! As an update to the federal park spreadsheet, New York has a federal campground in New York City. I stayed in Brooklyn last summer at Gateway NRA-Floyd Bennett Field on Jamaica Bay. It has primitive camping and more than 5 RV/Camper sites with no hookups but with the cleanest restrooms/shower I ever saw at a National Park. Surprisingly, its very safe with convenient access to New York city by a short buss ride up Flatbush and the N train into Manhattan. Best of all, with an annual or senior pass the cost is $10 per night! Of course, the cellular service is good and you have to follow the truck routes into the city if you have high clearance requirements. For amenities, there is biking, fishing, hiking, aviation museum, and boating. We stayed 10 days and had a great time. Its was not in any Campground directory at the time we went or included in NP campground data. We heard about it from another RVer familiar with the area and called to make a confirmed reservation, although it was not needed then, only 3 other RV/campers. You may want to call them to confirm it is still an RVer option to visit New York city. Thanks again for your great source of RV satellite how-to.